Tim Truman is the supervisory public affairs specialist in the International Trade Administration’s Office of Public Affairs. Assistant Secretary for Global Markets and Director General of the U.S. and Foreign Commercial Service Arun Kumar (center) joined representatives from 24 U.S. economic development organizations and their partners for the SelectUSA Greater China Roadshow stop in Guangzhou. Economic development officials from 11 states and the District of Columbia just spent 12 days visiting nine cities throughout greater China recruiting potential partners and investors to complete important projects in their local areas. 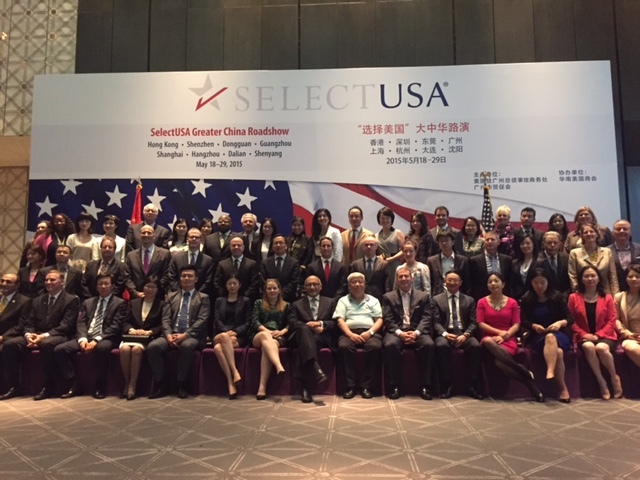 The SelectUSA Greater China Roadshow wrapped on May 29 in Shenyang after 470 meetings and matchmaking sessions between U.S. and Chinese officials and business leaders. China is among the fastest-growing sources of investment in the United States, with a compound annual growth rate (2009-2013) exceeding 41.5 percent. This Roadshow event followed closely on the heels of the 2015 SelectUSA Investment Summit in March, where the Chinese delegation was the largest international group for a second consecutive summit. This was the second time the U.S. Commercial Service and SelectUSA hosted U.S. economic development organizations and their partners seeking investors in China. In 2014, the inaugural SelectUSA Pearl River Delta Roadshow made stops in Hong Kong, Shenzhen, Shunde, and Guangzhou. This year’s event launched in Hong Kong, and featured stops in Shenzhen, Dongguan, Guangzhou, Shanghai, Hangzhou, Dalian, Anshan, and Shenyang. The United States is home to more direct investment than any other country in the world, with a total stock of $2.8 trillion, and has been ranked No. 1 in the A.T. Kearney Foreign Direct Investment Confidence Index for a third straight year in 2015. For more information about SelectUSA, visit www.selectusa.gov.